Uptown Update: News-Star: "Pot Clout Surprise!" With the potential medical marijuana dispensary at 5001 N Clark in the news, a reader who attended the WFCW meeting this week found an article in the News-Star newspaper about it, dated 12/10/2014. With the kind permission of the publisher, Ron Roenigk, for Uptown Update to reprint it, she thought the information would be interesting to our readers. News-Star will run a follow-up story next week as well. You can see some of News-Star's articles on its Facebook page, and all of them on its website for a $10 annual fee. The paper is also available free around the area. A reminder that the NUNA [North Uptown Neighbors Association] block club also will vote on this dispensary at its meeting on February 4th. According to Edgeville Buzz, there will also be community meetings hosted by Andersonville Chamber of Commerce and Uptown Business Partners. 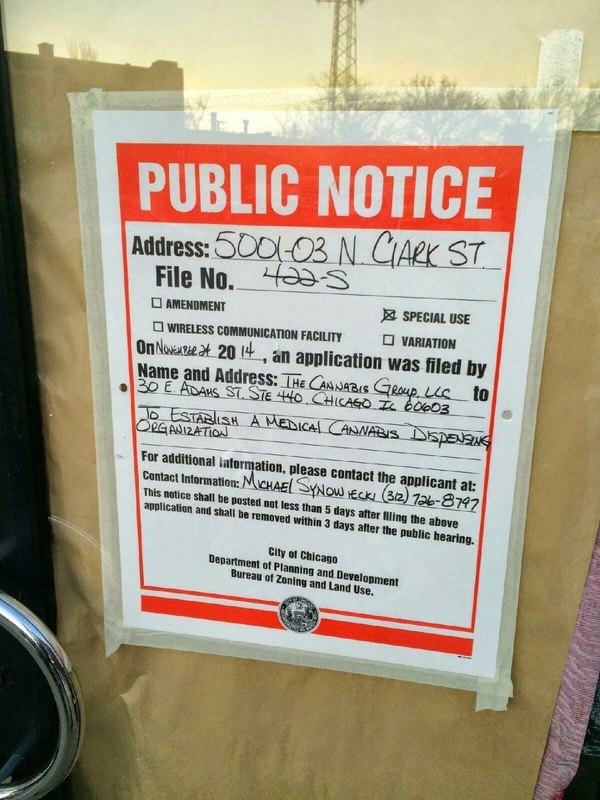 During the week of Thanksgiving, an attorney for a team of investors well-known in local and state government circles sent out a notice to some Uptown residents that his clients were interested in opening a cannabis store in Uptown at 5001-5003 N. Clark, the site of a shuttered pizzeria. Using the company name The Cannabis Group, the owners of the proposed store include Zachary Zises, a locally-based venture capitalist who also is principal of the locally-based Local Government Regional Center of Illinois (LGRCI). The company, LGRCI, helps wealthy foreign-investors obtain permanent resident status in the U.S.
Zises’ foreign investors come from the small group of wealthy foreign nationals known as the Fifth Employment-Based Visa [or EB-5] that seeks to capitalize on the interest of financially successful foreign citizens in becoming permanent residents of the U.S. This program allows foreign investors to enter the U.S. as conditional residents soon as they have made their investment [minimum of $500,000], to have their visa restrictions removed, and to receive their Green Card just 18 months later. Zachary Zises founded that company with his brother Bryan Zises, the current chief operating officer for the state’s Illinois Housing Development Authority [IHDA]. The IHDA loans money for affordable housing. His future employment with the IHDA is uncertain once governor-elect Bruce Rauner takes over. Earlier, the pair had worked together as co-operators of a film company. Also listed as co-operators of the proposed cannabis store are Kristie Zises (Bryan's wife who co-owns a building with him on the 5000 block of N. Wolcott) and Paul Lee, who worked at a similar shop in Colorado. Bryan was an early supporter of Ald. Ameya Pawar [47th] when he was running for alderman. He also served as a spokesman for a anti-Iraq war organization, promoted a number of liberal politicians and leftist causes, and once worked for noted leftist radical Marilyn Katz at MK Communications. In the same email, co-operator Lee, is described as a one-time legal marijuana worker in Colorado and Kristie Zises is described as a Chicago real-estate veteran, though she appears to have given up her real estate license. The nascent medical marijuana industry has drawn interest from many quarters. The city’s Zoning Board of Appeals [ZBA] has already approved nine marijuana shops. In addition, the board also denied one applicant and postponed a review on six others. Among those approved to operate a marijuana shop is Perry Mandera, who operates a near north strip-club and is a local trucking magnate." You can read the rest of the story at News-Star's Facebook page or behind the paywall on its website. I suggest taking everything from New-star with a grain of salt. They're our own miniature Fox News.